Diploma in Occupational Health - McMaster University; Certified Occupational Health Nurse (Canada); Safety Auditor Accreditation - AD Little, Boston, Massachusetts; Ontario Occupational Health Nurses Association (OOHNA) Award of Excellence recipient 2004, Applicant for Certified Trauma Specialist Designation (ATS) - 2008. As an Occupational Health Nurse she has developed onsite Occupational Health and Safety Programs for several industry sectors including plastics and glass manufacturing, mining, oil fields, grocery warehouses, steel companies and educational facilities. Sue presently sits as a consultant on several Joint Health and Safety Committees (JOHSC) for clients in various industry sectors. Sue also provides Independent Mediation Services for occupational health or disability management related incidents. 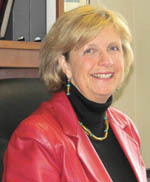 While National Coordinator of Rehabilitation Services for an automotive insurance company, Sue developed a Service Provider Evaluation/Audit process which resulted in the widely utilized industry standard Rehabilitation Service Guidelines which received an award of excellence at the World Congress of Rehabilitation International in Auckland, New Zealand (1996). Sue has worked with both employees and management following workplace incidents such as bank robberies, work rage, workplace accidents, post traumatic interventions, natural disasters and environmental response issues. She has provided critical incident support to a remote mine site of 700 employees after a tragic work site death. She co-leads (with Dr. Roger Solomon) retreats in peer support workshops for both the railway and financial industries. These retreats are conducted twice per year at a location outside Kingston, Ontario. She was a member of a Corporate Intervention Team sent to support employees in Canadian headquartered companies in New York during Week 1 post 9-11. In the summer of 2007 Sue was part of a debriefing team working with Police Peer Support Groups in the U.S.
Sue has been a guest speaker at numerous conferences and seminars, lectured on Worksite Health and Safety Issues for a university program, has co-authored several articles on Health and Safety, Environmental Issues and Critical Incident Management. She has just contributed to her first published book `HR Manager's Guide to Health and Safety - Ontario Edition'. In 2003 Sue managed the SARS response and education program for a leading healthcare management company for their corporate clients, including major financial institutions and regulatory bodies, numerous large law firms, three communication companies and numerous other small employers. Sue was the manager of program implementation for setting up `safe sites', information and training for employees and monitoring possible SARS or SARS related cases in the workplace. She is now a resource for several large corporations in their Pandemic preparations. For the past eight years, Sue has managed Flu Clinics for the corporate industry in Ontario. From our initial service provision of 1400 injections to over 7000 in 2008, we continue to work with an excellent group of registered nurses who understand the corporate world and the need to work with their clients in a timely professional manner. To date Brady and Associates Inc. has vaccinated over 30,000 individuals with a client retention rate of 98%. Our Corporate Flu Clinic Program extends from our home base in Ontario to British Columbia, Alberta, and other provinces across the country.